*This is for patients with commercial insurance excluding managed Medicaid. Covered is defined as patient has access and plan coverage of product at any formulary tier, and product is not NDC blocked. Step edits, prior authorization, and other restrictions may apply. †Commercial insurance excluding managed Medicaid. Covered is defined as patient has access and plan coverage of product at any formulary tier, and product is not NDC blocked. Step edits, prior authorization, and other restrictions may apply. ‡Health plan or PBM blinded for contractual reasons. AbbVie is committed to helping appropriate patients obtain access to Synthroid by providing reimbursement and access information. Please be aware that coverage requirements vary by payer and change over time, so please consult with each payer directly for the most current coverage and reimbursement policies and determination processes. This material is not intended to provide reimbursement or legal advice. AbbVie does not guarantee that the use of any information provided here will result in coverage. The health plans and/or pharmacy benefit managers listed here have not endorsed and are not affiliated with this AbbVie material. Eligibility: Available to patients with commercial prescription insurance coverage for Synthroid who meet eligibility criteria. Co-pay assistance program is not available to patients receiving prescription reimbursement under any federal, state, or government-funded insurance programs (for example, Medicare [including Part D], Medicare Advantage, Medigap, Medicaid, TRICARE, Department of Defense, or Veterans Affairs programs) or where prohibited by law or by the patient’s health insurance provider. 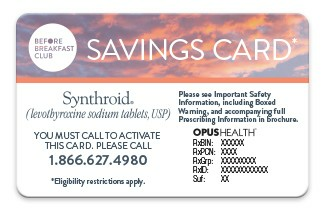 If at any time a patient begins receiving prescription drug coverage under any such federal, state, or government-funded healthcare program, patient will no longer be able to use the Synthroid card and patient must call OPUS Health at 1.866.627.4980 to stop participation. Patients residing in or receiving treatment in certain states may not be eligible. Patients may not seek reimbursement for value received from the Synthroid Co-pay Savings Card from any third-party payers. Offer subject to change or discontinuance without notice. Restrictions, including monthly maximums, may apply. This is not health insurance. Please see full Terms and Conditions. For eligible commercially covered patients, 90% will pay no more than $25 for a 30-day prescription and 94% will pay no more than $75 for a 90- day prescription when a Synthroid copay card is used. (Data as of January 1, 2018). ||Covered is defined as patient has access and plan coverage of product at any formulary tier, and product is not NDC blocked. Step edits, prior authorization, and other restrictions apply. ¶Health plan or PBM blinded for contractual reasons. 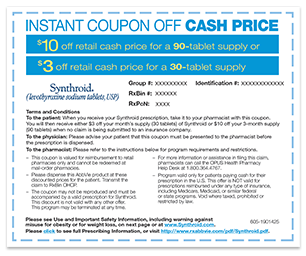 If your patient is not covered by an insurance plan, they can still save on Synthroid by going to Synthroid.com and signing up for $3 off a 30-day prescription of Synthroid or $10 off a 90-day prescription.